Which was feeding off a leaf on the Apple tree. My effort is now posted by a very happy Me! I believe it to be a Common Blue Tail Dragonfly. What a nice capture. Those little critters are so hard to photograph. You are so right Linda..they are so flighty. know they have such round heads. It is true...I have never seen them here before. They flew in stayed for a very short time and were off again. Thanks Sue and I actually got a couple more good shots with great detail...I love those big blue heads lol remind me of a bugs life. OH gosh that is a simply amazing capture .... stunning colours .... too beautiful ..... well done you!!! Thanks Lynne. the good news is that it is as taken apart from the text and drop shadow frame. Don't you just love when those amazing, unexpected moments happen??? Right place and perfect timing....absolutely stunning pic! The blue is his/her eye...NO? Your introductory write to that magnificent photo was a DELIGHT !! thanks for visiting, Milli ! Creative Challenge #150 " Life~as Viewed by ME "
On the site that provided the Gun Powder for Guy Fawkes, the River Lea supplies the wetland for the Dragonfly Sanctuary in East London. This one looks a Royalist if every I saw one. A good thought for this week when we cheer the long reign of our Royal Family. Thank you Milli. lol lol lol. here like it is enjoying some leaf. They are actually blue along the tail too. Viewed best from looking down on top of them. I had to shoot upwards looking as straight as I could at the screen. Hence Blue Tail Dragonfly. Thanks Linda. Actually I did read this Sue..in fact they will eat any small insects on the leaves. Probably something very small we could not even see. They can feast on any Mozzies that they find. I do not like mozzies. LOL..I will be watching the ROYAL WEDDING from my humble abode Bill..are you going to the wedding? That' a four four sure good buddy. That's such a stunning pic. The verse well written and thanks for taking us on a little excursion. You are always welcome Nik. Oh, wow! You've captured every detail! beautifully intricate photo and cute words to descibe the event! Incredible photo! Timing is everything. A good lesson in always being prepared. Bravo! Fabulous photo Milli !! I love photographing these guys. 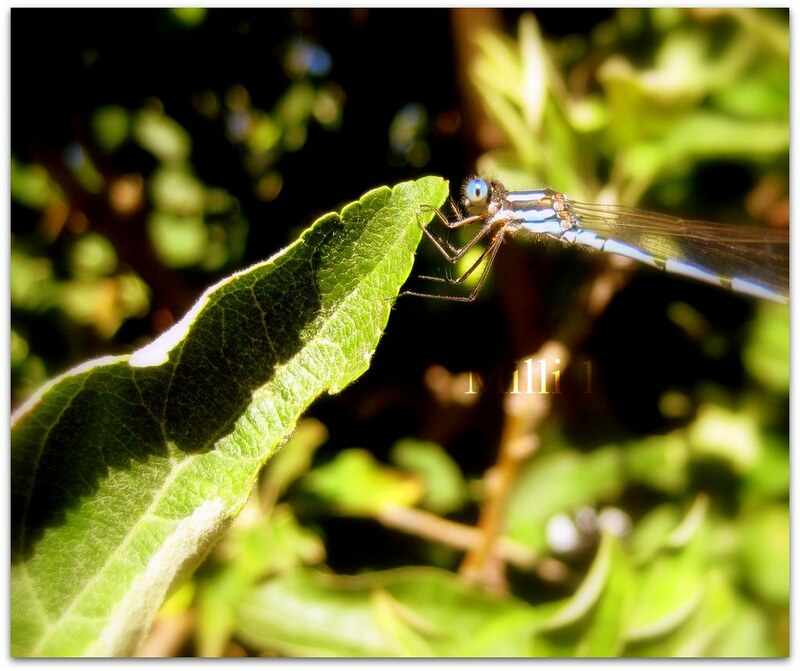 This is actually a Damselfly, which are usually smaller and narrower with a smaller head than a Dragonfly. The blue ones, such as this one, are my faves. Such a gorgeous shot.. That guy/girl is truly one of the kind. Is it rude to stare? guess the monitor wouldnt mind :P.
What a beautiful combination of words and photography. It takes something like this to make us really appreciate the earth and all its wonders. Unfortunately this week I decided to take the total opposite approach to things. Ah; the best from down under we have here amongst us!